VietNamNet Bridge – Economists believe that it’s now the right time for Vietnam to cut down the rice growing area, especially when farmers now tend to give land back to the State. A report of the Ministry of Agriculture and Rural Development (MARD) showed that farmers in six provinces of the Red River Delta and central region, 1,000 hectares of rice fields have been left uncultivated. The figure is really alarming if noting that Vietnam is an agriculture country which is now the biggest rice exporter in the world. The MARD’s plan on converting 200,000 hectares of land for rice fields into the land for growing other plants which can bring higher profits has got the support from experts. MARD Minister Cao Duc Phat stressed that the ministry only recommends using the land for growing other kinds of plants, not using the land for other non-cultivation purposes. This is believed to be a good idea to help persuade farmers to come back to land fields. Director of the Quang Binh provincial Department of Agriculture and Rural Development Phan Van Khoa also said it’s the time to speed up the process of plantation restructuring. 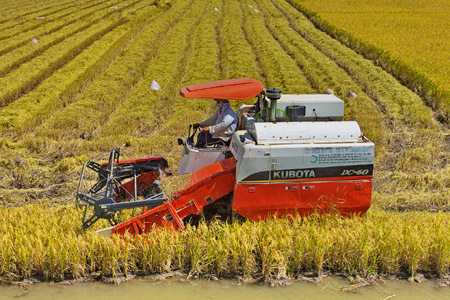 High quality and specialty rice should be grown on the fertile land, while other farm produce should be grown on the current ineffective rice fields. The idea that Vietnam does not need to maintain 3.8 million hectares of rice fields has become the burning issue for discussions. Former Deputy Minister Nguyen Cong Tan, at the interviews given to some local newspapers recently, suggested a daring idea that Vietnam should cut down 2 million hectares of rice growing area and grow other plants instead. The idea is really shocking. No one could imagine that Vietnam, the biggest rice exporter in the world, would cut down its rice farming area one day. Tan admitted that the reduction of the rice farming area would lead to the loss of several billions of dollars from rice exports. However, he said Vietnam would get a lot of other benefits. For example, instead of growing rice, farmers could grow maize to provide materials to animal feed producers. This would help reduce the imports and help the livestock industry ease the reliance on animal feed imports. The maize supply is always short in the world market, therefore, Tan said no need to worry about the oversupply and get reluctant about the expansion of the maize growing area. Vietnam has been taking pride as a big rice producer and exporter. However, while it exports more and more rice year after year, the farmers’ lives have got worse and worse. Vietnamese farmers have given up rice fields, even though land is “as valuable as gold.” It is because they cannot live on rice farming. With the low price of VND5,000 per kilo, farmers can get the turnover of VND60 million a year for two crops, and the profit of some VND10 million. However, Nguyen Dinh Bich, a rice expert, has warned that it’s necessary to consider the possible consequences to be brought by the sharp cut of 2 million hectares of rice fields. No one can be sure that once the rice field area is cut by 2 million hectares, the farmers’ income would be double. Meanwhile, this would raise the concern about the national food security.